When a customer places an order on the site or via call centre an order gets some status for the store administrator to see whether the order is successful or failed. In addition, an administrator can set/change the status of the order by manually updating the status of the order at each order processing stage. To add/edit an order status please navigate to Administration > Sales Orders > Order Statuses. Here you can see a full list of default statuses. Presently, there are 17 statuses supplied with ViArt Shop, the order statuses can be sorted by their ID or name. New order placed – this status is set to an order when a customer passes the first step of the checkout (this is order_info.php page) and does not complete the whole checkout process. This can also be referred to as Abandoned Baskets. Payment details - this status is set to an order when a customer enters his credit card details and the payment system confirms their validity. This means that a customer has successfully passed the second step of the checkout - credit_card_info.php page. Confirmed by User - this status is set to an order when a customer presses the 'Continue' button on the order_final.php page and thus confirming all order and payment details. Paid - This status is set when the payment is successfully authorized by the payment system. Pending - This status is applied when a differed payment system is used. Failed - This status indicates that a transaction failed. Goods shipped/Dispatched - either of this status sets for an order that is dispatched to a customer. Cancelled/Declined - these statuses are applied if a customer cancels an order. Refunded - this status is applied when for any reason a customer asks for money back. Apart from these, there are a few statuses available which can be used to determine the order status at various steps. ViArt platform allows a store Admin to use existing statuses, edit them or create new statuses. In addition, you can set your own statuses for successful, pending and failed transactions. 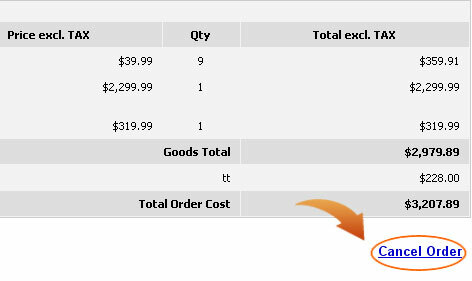 This is done via the payment edit page (if you use API payment systems) or via Final Checkout Page. Just select a status you want from the drop down list and if the payment system is set properly the orders placed on your site will get the statuses you've set. Is Active enables the status. Status Order - is a required option that defines the status order number (i.e when a drop down list of statuses is used and you need to specify the order in which to display statuses). Status Name - is a required option. Enter a name for the status you create/edit. This name will be visible for both an administrator (Order Maintenance section) and a user (on his user_home page). Status Type - select a status type for the status. This can be a paid or shipped status or some other type. Paid Status - defines whether the status will be a paid one (for successful purchases) or non-paid (for other orders). Activation of downloadable products (including links, serial numbers and gift vouchers) - if an option 'Activated' is selected, serial numbers, downloadable links and gift vouchers are automatically activated when the order has this status. If an option 'Disabled is selected' you'll have to manually activate serial numbers and links on the order's edit page. Notification for downloadable products - if enabled, notifications that are set on the Downloadable Products Settings page are automatically sent to a customer if an order gets this status. Press the 'click here to configure email settings' link and set notifications for downloadable products. Commission and Reward Actions - if you have merchants or affiliates in your store select 'Add commissions, reward points and credits' (to add points or credit to a merchant/affiliate account if an order gets this status) or 'Subtract commissions, reward points and credits' (if you do not want to add points or credits to a merchant/affiliate account if an order gets this status). Stock Level Action - select a 'Reserve' option value to deduct the number of purchased items from the products stock level if an order gets this status. Select a 'Release' option value to keep the product's stock level amount untouched if an order has this status. Note: To use this option please ensure that you've activated a stock level option on the product's edit page. Points Action - select 'Subtract points from user balance' to deduct points (if any) from a user balance when an order gets this status or 'Return points to user balance' to keep points on a user balance. Credit Balance Action - select 'Subtract credit amount from user balance' to deduct credits (if any) from a user balance when an order gets this status or 'Return credit amount to a user balance' to keep credits on a user balance. When creating/adding a status you'll see 7 default properties which you as a store administrator decide whether to enable or not. To make this decision, it is necessary to know what each property means. Let's take a closer look. If order has this status user can cancel such order - if enabled, a link Cancel appears on the order details page when a customer clicks the View link against an order on his user home page. If a customer decides to cancel this order for some reason he clicks the link and the status of the order is changed to a Cancelled. Set this status when user has cancelled the order - a store Admin can set this status for the order that a user cancelled/declined. If order has this status user can see and download invoice for such order - if enabled, a user is able to view/download a pdf/html invoice for his order. Note: in order a pdf invoice is attached to the notification and is to be sent to a customer this option should be enabled for any Paid status along with the option 'Attachments - PDF Invoice' on the Final Checkout Settings page for a payment system you use. Generate separate packing slip when status applied - this option generates separate packing slips if a store administrator wants to set different status for individual products within one order. For example, a store Admin can shipped only 5 products out of 10 that were purchased in one order. He manually changes the status for 5 items to shipped and press to generate a packing slip. A separate packing slip will be added for these 5 items. Show orders with this status in the orders list for administrators by default - if selected, a store admin can view orders with this status in the Sales Orders screen. 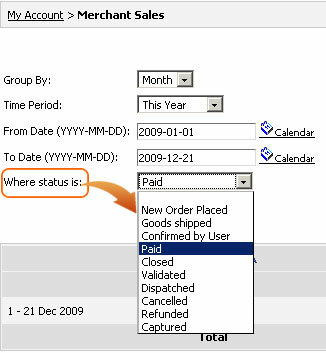 Show orders with this status at Merchants or Affiliated Sales statistics - if enabled, the status will be displayed in the status drop down list in the Merchant or Sales statistics sections (on the user home page). A customer will be able to select a status and filter his sales for a particular status. Send product specific notifications when status applied - if selected, notifications that are set for a specific product (on the product edit page) are automatically sent if an order gets the status. You may want to add a specific final checkout message for a particular order status. If specified it is added to the final checkout message that is set for a specific payment system and both messages will be displayed on the order_final.php page. Create a script (i.e. success.php) - you can use a notepad or any text editor. Save the file to your /payments folder. Go to http://www.yoursite.com/admin/admin_payment_system.php?payment_id=1 and enable Advanced Library Option. Press to save the changes and make a test purchase to check.